I was going to do this for yesterday, but since it was April Fool’s day I decided to hold off, since everything about this headline sounds like a bad April Fool’s joke. Lucas Electrics has been continually roasted by gearheads more than a pig on a spit, and if that spit was being turned by a Lucas Electric motor, one side would be burned to cinders while the other remained frozen. So, as you can imagine, the idea that Lucas, the Prince of Darkness, built an entire car, made entirely of Lucas parts, might seem like a joke to people. But it wasn’t a joke, mostly because the 1973 OPEC oil embargo was very much not a joke, either. 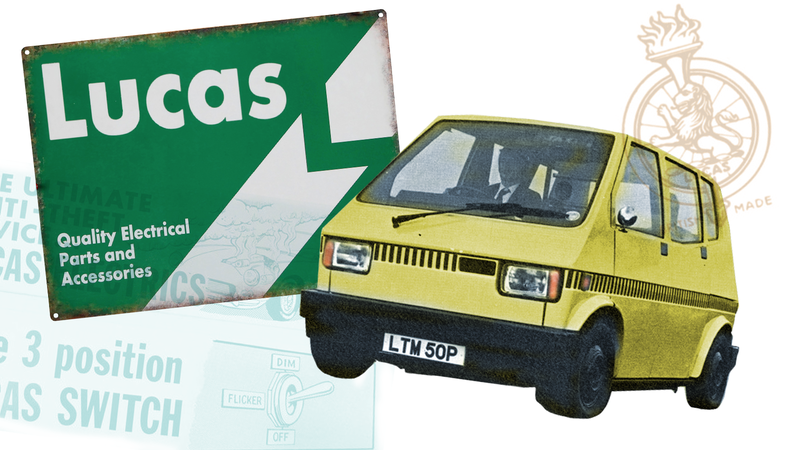 That oil embargo scared Lucas into looking into some non-oil-based options for cars, which is why they started an electric car project in 1975. So, based on that, it’s clear that Lucas was taking this thing seriously, and wasn’t just planning on some fragile technology showcase. For the design of the car, Lucas went to Ogle, who’s best known for designing cars like the Bond Bug and the lovely Reliant Scimitar. Ogle came up with a simple but clean one-box/small van design that used the available space remarkably well, something very important in a taxi. 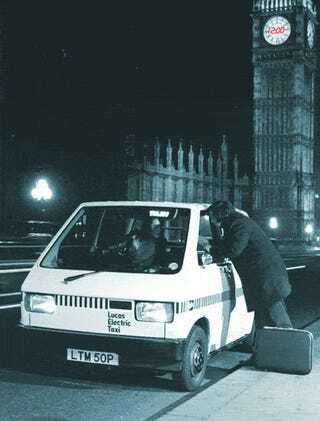 The taxi was designed to be front motor’d and front-wheel drive, with the heavy (and relatively inefficient, by modern standards) lead acid batteries slung under the main body, where they could be removed and replaced relatively easily, something modern EVs have yet to demonstrate. The drivetrain incorporated a 216-volt, 50 horsepower engine, which was capable of getting the 4,800 pound taxi up to a top speed of 55 MPH, and with a range of around 100 miles. Let’s just think about those numbers for a moment—for 1977, those were damn impressive EV specs. The speed is actually useable, especially when you consider this was a taxi, a car for a city, and 100 miles of range is actually fantastic for lead-acid batteries. Lucas somehow managed to squeeze 13.6 watt-hours per pound of battery, when the conventional amount at the time was only 10-12. Compared to modern batteries, it’s terrible (modern lithium-ion cells get well over 60 watt hours per pound, but for the time, it’s downright impressive. It’s not really clear just what Lucas’ plans for the car were. They built at least two prototypes and shopped them around to car shows and tested them a good bit, but they claimed they had no plans to produce them on their own. They also admitted (in a writeup in the October 1975 New Scientist) that the cabs would cost around £5,000 when a diesel cab would only cost around £3,000, which made the idea that these would be competitive pretty absurd. And, let’s be honest here, if it had actually been built by Lucas, it’s very possible that the first time some London cabbie plugged it in to be recharged, it would have shorted out the entire British Isles. Okay. I bet you kooks can think of a lot more, so stick them in the comments and let’s all enjoy a very traditional chuckle at the expense of our old nemesis, Lucas.